If you ever want to run a marathon major pick Berlin. It is just fantastic. I headed out to Berlin early doors on Saturday arriving mid morning. I took a taxi straight to the exhibition with Joe and Olwyn Dunne from Crusaders. Joe having encyclopedic knowledge of everything gave a very interesting history lesson on the way, which included the fact that the exhibition was in a building that was at one stage the biggest building in the world. I had recently read a race report from Valerie Fogarty and had picked up lots of tips on getting your number and getting to the race efficiently and had taken notes. When we arrived at the exhibition we were lucky in that the queues were not too long and with all the pre-printed tickets (thanks Valerie) it was a fairly easy process to pick up the number and Tee's. The exhibition itself was huge. I'd estimate around 3 times the size of Dublin with every running accouterment you would ever want on sale. I spent a few hours there. I had long since lost Joe and Olwyn. Then it was off to find the hotel trying to navigate the U and S Bahn systems. I had an address and knew it was close to the Ostbanhof. I'm not joking when I say it took 45 minutes searching for it before I found it. It was down a poky side street in a real dodgy area of town. I was shocked when it turned out to be brand new and 4 star. However I got an even greater shock when I went to room to realise this must be one of those boutique fetish joints. Enough said. Off I went to check out a few of the sights (I have been in Berlin a couple of times so knew my way around fairly well). First up was the Brandenburg Gate. This had been transformed into "Marathon Village" and there were several races on. First up was a kids race who got the opportunity to run the last couple of K of the marathon. There was a huge crowd there and when a group of special needs kids came past with their carers/parents or siblings there wasn't a dry eye in the house and the biggest cheer you would ever hear. It was real lump in the throat stuff. Next up was a inline skating marathon. This was awesome and the speed was absolutely incredible. I headed off to get something to eat and back to enjoy the hotel. the start with 40000 others. Everything worked like clockwork and I got to the start 30 minutes before the off. We were immediately treated to an obvious hit song in Berlin called "This is a marathon, through the streets of Berlin". I was in the second wave behind everyone who thought they could beat 3:30. That meant pretty much of all the other Crusaders. The first wave was off and we had to wait 10 long minutes before we could get going. The announcer came on and said "You will all clap you hands to the music" and so we did. recognise the runner but soon learned it was Denis who has just joined the club. He was to go on and do 3:36. I had a plan today for a 4:15, that was going to be a 2hr first half followed by a 2:15 second. This was reasonably agressive for me so I went off at a pace sticking with the 3:45 pacer. The music enroute was fantastic with many many bands. The support was also fantastic. Not quite as many people as London or New York but never the less great. The only downside for me was the water stations which were carnage as you waded through 300m of plastic cups. No bottles. The guys at the front wouldn't have had to deal with this. I noticed that there seemed to be half of Demark either running or supporting. I think it is a national obligation in Denmark to wear national colours and as many flags as possible. The Crusaders top looked a bit Danish and I reaped the benefit of much extra support. The Irish were also out in numbers with many shouting me on. I stayed with the 3:45 pacer to half way but knew he was going too slow as we both came in half way at 1:59 to be joined by the 4hr pacers immediately (on plan). The 3:45 guy gave up soon after. I stayed with the 4hr pacer through 29km when disaster struck. I had noticed that one of the sponsors "Erdinger" had a number of runners running in costume (8 ft sponge beer bottles). There was one in the group with us. Then all of a sudden the beer bottle swerved across me and I bounced off his sponge suit and ended up in the cobbles. Luckily I didn't hit my head but the rest of my left side didn't fare so well. My shoulder to my knee got hit bad. Noone came to help. I got to my feet but my knee had froze. I hobbled Jake-the-peg style to the 30km aid point seriously thinking about a DNF for the first time ever. Fortunately they had a massage area and a young frauline managed to free up my knee and I decided to continue. But my race was gone. I kept a slow but steady pace from then on deciding just to enjoy the atmosphere. It was also hot and getting hotter and my leg hurt like hell. The finish was just special and iconic. It was worth doing it alone for this. 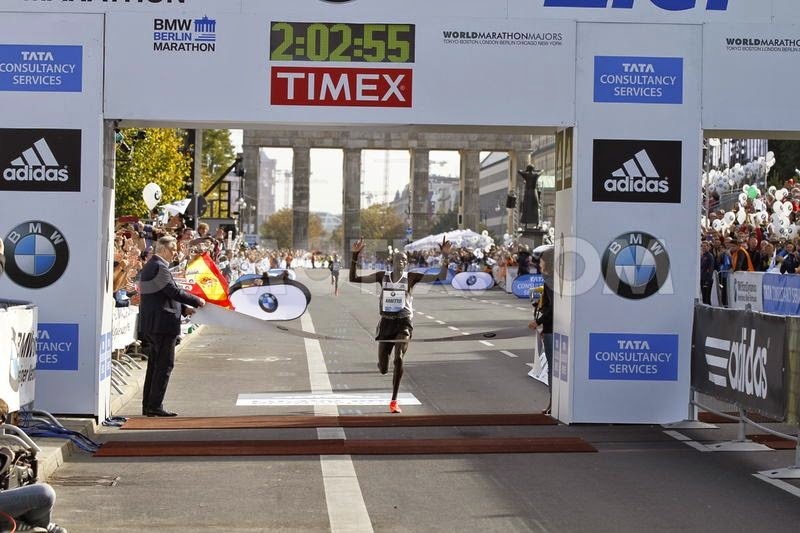 You passed under the Brandenburg Gate and to a great finish, 500m after. I limped across the line and picked up a well deserved medal. Phew!!! 4:28 would have been a lot better if it wasnt for that Erdinger bottle. I met up with the Crusaders in the "Oscar Wilde" and Stephen Mullins dropped in on the way to the airport. It was great fun recounting the various good and bad stories from the day. O yes and it was pretty cool to be in the race where the world record went. Garmin stats for the day.